It is with a mixture of sadness and excitement that I announce that the chapter of my life as a professional cyclocross racer has come to an end. The past three years of racing CX have been some of the happiest of my cycling career. It has been an honour to be national champion and a privilege to work with the best people and equipment in the world. The CX community around the world has been like a family to me. All these things make the decision to leave professional racing a difficult one. This announcement is the end of a long decision making process that I made in consultation with my sponsors and the A-team. It hasn’t been easy, and I want to thank them for their understanding and support during a challenging time. It’s no secret that I’ve been struggling with my health for the past few months. After failing to recover from my last European season I’ve realised that my body is no longer able to cope with the demands of a full CX season. In the past two years especially, between working full time and trying to train full time, I have been pushing my body beyond what is sustainable, and it has simply hit its limit. I have been through more tests and seen more specialists in the past few months than I’d care to relate. At the end of the day, what my body needs is time to recover fully. It is frustrating, but my health needs to take priority. While I’m sad to be leaving this level of sport a year earlier than I’d have liked, I am excited as well. I cannot tell you how much happiness cyclocross brings me, and once my health is back on track, I’m looking forward to racing domestically and for fun. I’m looking forward to adventures with my mates, to sleep-ins on rainy mornings, and to spending time with the people I love. Standing on the sidelines for the next few months is going to be tough. 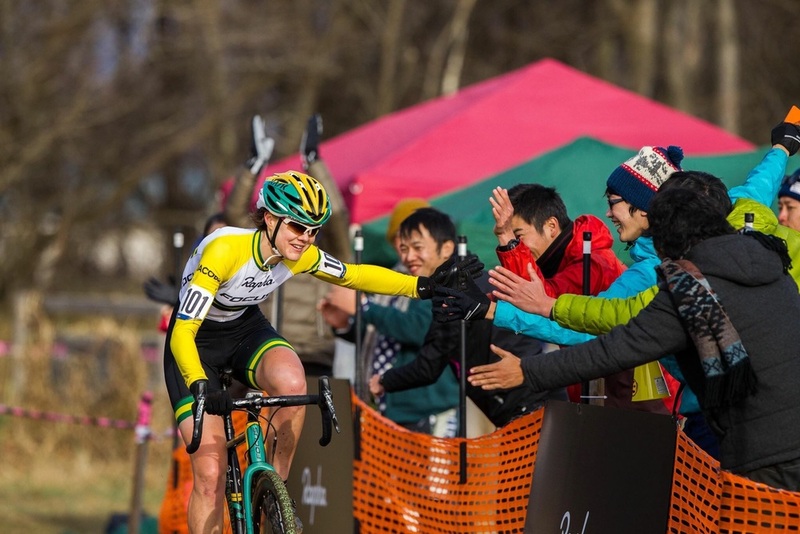 But seeing cyclocross flourish and grow, particularly in Australia, gives me great joy, and I plan to be a part of that for a long time to come. My elite cycling career has spanned almost ten years, first on the road and then CX. I never expected to start an elite cycling career at 25, and I never would have imagined I’d still be here at 34 in an entirely different discipline. This journey has been unexpected and brilliant. It has been the hardest thing I’ve ever done, but it’s given me some incomparable moments. More importantly, it’s brought lifetime friendships and experiences that will stay with me forever. 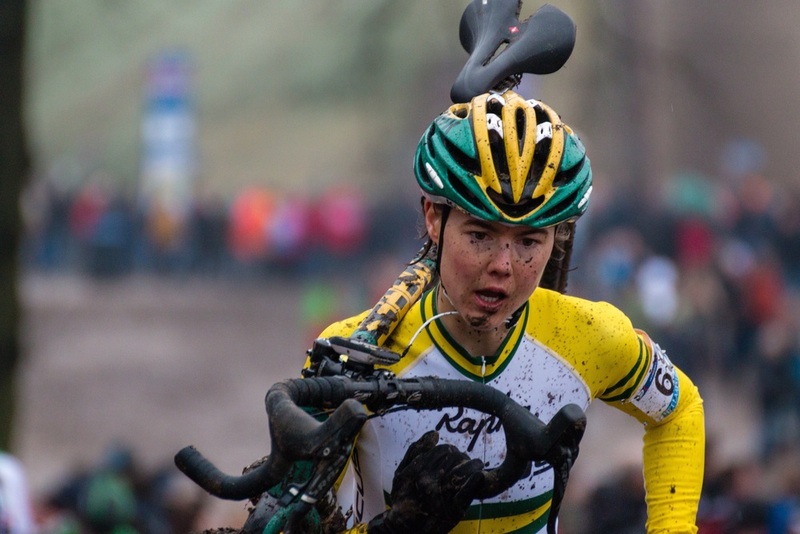 The women’s Giro d’Italia, the 2011 AIS survival camp, my VIS family, racing on the Australian road team, and those bloody ergos Donna dreamed up before my first CX national champs win… these memories stick with me like a hook that I can hang onto at times when I need strength. Likewise, the people I’ve been privileged to work with have taught me more than they’ll ever realise. There are too many to name them all here, but I need to give special thanks to the Supercoach Donna Rae-Szalinski, Neil Ross, Harry Brennan, Nick Owen, Wendy Braybon, Dr Andrew Garnham, Ryan Moody, to my Belgian crew of Christian, Frank, Dirk and everyone at Hof Ter Kammen, to the Fields of Joy crew, to DC Cunningham, Paul Larkin, Scooter Vercoe, John Groves, Murray Fenwick, Marcus Speed, and to Gary West and Ben Cook from my SASI days. I also want to recognise my awesome sponsors: Rapha, Focus, Curve, SRAM, FMB, Kask, Salice, Tune, Feedback, Horst Spikes and SQlab, and to those who have supported me in the past, particularly VIS, SASI, health.com.au, Apollo, Perfect PIlates, Fitzroy Revolution and Swiss Eye. These people have given me the freedom and opportunity to race at the highest level with the finest equipment in the world. I am extremely fortunate to be able to choose who I work with and to be able to work with the best. Every time I jump on my bike I remember how special that is, and how much fun it’s been. I’m looking forward to the next chapter. So today I woke up sick. Not something you want to happen two days out from a world championships! So instead of heading to Zolder to do course practise today, I'm in bed, dosed up with cold & flu medication and trying not to think too much about the weekend. It's terrible timing, but these things happen in racing and there's not much you can do once you're sick - just wrap yourself in cotton wool, watch terrible daytime TV and try to get better. I'm hoping I'll be well enough tomorrow to go to course practice but that's a decision for tomorrow. In the meantime, here's a picture of Cipo showing what exceptional luft looks like. Best auspicious greetings honoured reader! This post be welcoming in heart and hope for longtime forgiveness of not earlier posting. Be that I have faced many adventures and much happiness in past week; no facebook make hard work of updating you my beloved reader. But fear not the iron instagram curtain, for today I write to you from aeroplane on way to USA, where much tweeting is welcome. So it follows, an account of Qiansen Cyclocross, UCI Cat 1 event, Beijing, China. A lot has happened in the past few weeks, including a new national title, a new team, and the beginning of a new CX adventure. National champs went well, mostly thanks to all the people who provided help, support, and occasionally counselling: the Supercoach, my skills coach Neil Ross, and the A Team of Paul Larkin, John Groves and Steve from Apollo in Adelaide who kept everything running smoothly. As far as I am aware, no marriages were harmed in the post-race celebrations. Winning national champs led to invitations to a couple of great early-season races: Qiansen Trophy CX in Beijing and Cross Vegas in USA. With work commitments ruling me out for world champs this coming January, these two races offered a great way of draining my annual leave balance whilst also building on my international CX racing experience. Racing Cross Vegas in the national champ colours happens also to be at the top of my bucket list, by the way (although to be fair, the list also includes Eating My Weight In Salted Caramel and Marrying A Swedish Prince*, so may not be a great reflection of my life goals). *Could also be a Baron; I haven’t looked too closely into the Swedish nobility nomenclatures. Last year, I raced Qiansen Cyclocross and broke my wrist with a suspected ACL in the first 5 minutes of the race. I finished 14th, because it seemed like a good idea at the time and Grover was yelling out from the pits that prize money went down to 15th. This year, the race was upgraded to a UCI Cat 1 event (one level below World Cup), and apart from more UCI points and a stronger international field, offered the chance of redemption over last year’s disaster. I thought it was a great idea. My parents, who had spent the week after last year’s race driving me between x-ray appointments, were less enthusiastic. Fortunately, the only person I really needed to convince was Paul Larkin, whom I consider to be the World’s Best CX Pit Crew and whose support at world champs and national champs this year has been nothing short of brilliant. Paul, having returned from last year’s Qiansen CX race 6.5kgs lighter after a particularly nasty bout of Beijing’s Revenge, went back on his promise never to set foot in China again and agreed to be part of the adventure. After having been a road racer for so long, one thing I’m learning about CX racing is the unique demands it places on a rider’s pit crew. On a muddy course, you can be changing bikes twice per lap (every 10 minutes or so), and you rely on your pit crew to catch your bike at speed, blast it clean and fix whatever is broken while you’re out on the course. Even on a good day, mechanics work as hard as the riders to prep equipment and fix bike niggles under pressure. Having a good pit crew that is organised, calm and good at working on the fly is essential. You rely on them not just to fix your bike, but to know which pit position is best, what tyre pressure to run, bounce off ideas for race lines and strategies, and help calm your nerves. Fortunately, not only is Paul one of the best, he is also happy to bring single origin coffee beans and put up with riders with OCD tendencies. So we make a good team. This year, the Qiansen CX ‘event week’ comprised 2 races: a CX race on the Saturday, followed by a demonstration road race in a neighbouring province on the Monday. The CX course was a repeat of last year: fast, twisty and brutally bumpy, with some technical parts that could bring you unstuck if you lost concentration. To add to the excitement, the event organiser had asked Paul and I and a couple of the other riders to take part in the CX amateur race held a few hours before the elite races. Our job was to stay at the front ahead of the local riders for the opening lap, then peel off and let them finish the race. Apparently last year staying ahead of the local riders was quite easy, but no one had told us that those riders had then spent the next 12 months training the house down on that same course. The result was a very effective pre-race workout and a new job for Paul as a human shield, protecting me from getting T-boned by a couple of enthusiastic locals who hadn’t been briefed on the race script. The CX race itself went well, with nary a broken bone in sight. I’d chosen a spot on the course right after a hard pinch, where I knew everyone would be knackered, as my point to attack if I needed to. In the first lap, I had chased up to third spot and was behind a French girl, Le Fevre, who had come 4th at world champs this year. I could hear her breathing hard so attacked hard just before that point and got a small gap. By the next lap she had caught back on, so I did the same thing and managed to drop her. Ellen van Loy, a Belgian who is ranked 6th in the world, was in a class of her own and won 22 secs ahead of me. I came in 23 secs ahead of former Danish national champion Margariet Kloppenberg who was in 3rd. 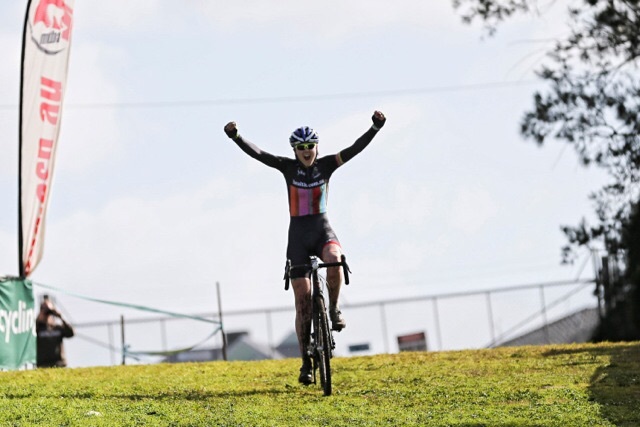 I was absolutely stoked – it’s a career best result for me, certainly in CX, and maybe for my whole riding career. All those skills sessions paid off Neil!! The road race on Monday was fun (especially on a CX bike with road tyres). The 11-hour bus trip was less fun, but still better than a broken wrist or a 6.5kg weight loss program, so Paul and I proclaimed this year’s China trip a success and set sail for USA. If Northern Californian CX racing is synonymous with file treads and cold beer, Qiansen CX was characterised by SSCs and an oversupply of all-you-can-eat buffets. Of the 5 nights we were there, there were 4 banquets, one featuring a Chinese version of the Spice Girls miming to traditional Chinese instruments. We felt very welcomed, if slightly overfed, and the hospitality of the event organisers reflected the region’s enthusiasm for growing CX and cycling in China. Next year they are talking of making it a world cup event: if it happens, it will give Aussie riders access to the highest level of racing in the world without having to endure 30 hours of travelling to do it. Phew! That’s enough for now. I started this post on the plane from Beijing to San Francisco, and now Pete, Paul and I are in a log cabin at Lake Tahoe, getting excited for some CX riding tomorrow on the trails here. Next race: Sacramento GP on 6 Sept, then Cross Vegas on 10 Sept.